Enough is enough! 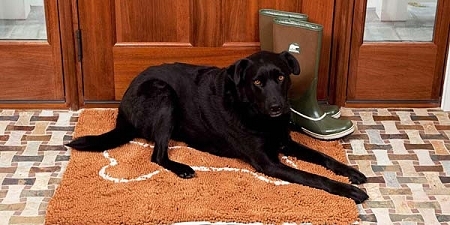 Soggy Doggy Doormat relieves you and your dirty pet from the messy and tiring routine that jump starts as your pup comes in from the rain and mud. Even when both you and your towels have been spent, your active pet�s body may still hold mud, dirt, and water to track through the house! Measuring at 26" x 36", the Soggy Doggy Doormat is ready to take over. It absorbs five times the water of standard cotton mats. In addition, the soft chenille fabric of Soggy Doggy Doormat is kind to your pup�s body, making it an ideal crate pad or car mat. 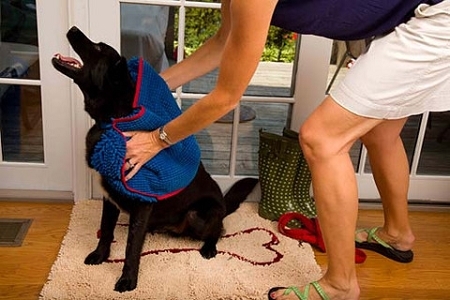 Measures at 26" x 36"
Place a Soggy Doggy at your back door to stop paw messes and water from entering your home. This velvety-soft doormat feels feather soft under the feet, but has extremely durable microfiber chenille construction that absorbs 5X more water than regular cotton rugs. Each of the "noodles" in Soggy Doggy is made from textured, ultrafine strands, all woven together so the surface area is much greater than meets the eye. Soaks up water quickly, and dries fast, too. Material is exceptionally hard working and durable, and yet goes right into the washer and dryer for fuss-free care. Non-slip backing provides stay-put coverage. Fits a standard 36" door opening or a 36" crate. 80% polyester/20% polyamide. 36" x 26". Please select color. Colors: Beige, Blue, Brown, or Caramel. 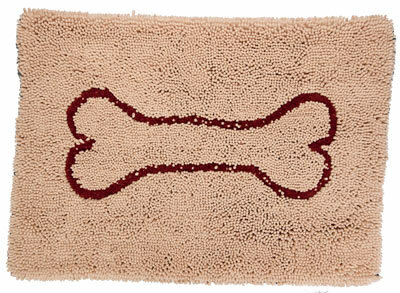 These super absorbent dog paw doormats are a lifesaver. I was a little skeptical at first, but the Soggy Doggy Doormat works amazing! With light tile, light carpet, and wood floors, we were constantly battling our dog's dirty paws. Not anymore :) The Soggy Doggy doormat works better than anything we have tried to date. See it put to the test in the video above. Your dog begs to go out in the pouring rain and then prances back inside, depositing water, mud, dirt and those annoying paw prints all over clean floors. Mounds of towels by the door and the world's biggest doormat are no match for the wet dog... But the SOGGY DOGGY DOORMAT is! ABSORBS 5X MORE WATER THAN REGULAR COTTON DOORMATS!! Each of the �noodles� in the Soggy Doggy Doormat® and Soggy Doggy Super Shammy is made from millions of textured, ultrafine strands woven together, so the surface area of these products is much greater than meets the eye! The expansive surface area is the secret to microfiber chenille�s tremendous absorbing power and super-fast drying! 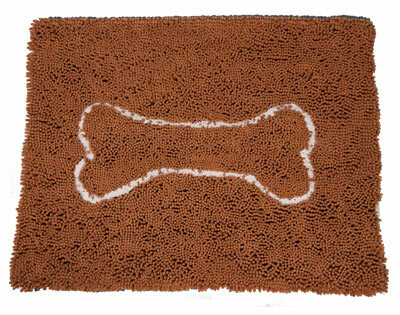 The microfiber chenille blend allows the Soggy Doggy Doormats® and Super Shammys to soak up water and dirt like a sponge! The doormats absorb 5x more water than regular cotton doormats and the Super Shammy can hold up to 7x its weight in water! The material is exceptionally hard-working and goes right in the washer and dryer! But the chenille also makes it velvety-soft and gentle under delicate paws and bellies.